The White Family came to Family Leisure looking for knowledgeable inspiration and professional execution for realizing their outdoor living dreams. Family Leisure delivered with custom attention to their property, and the resulting structures are attractive and functional. 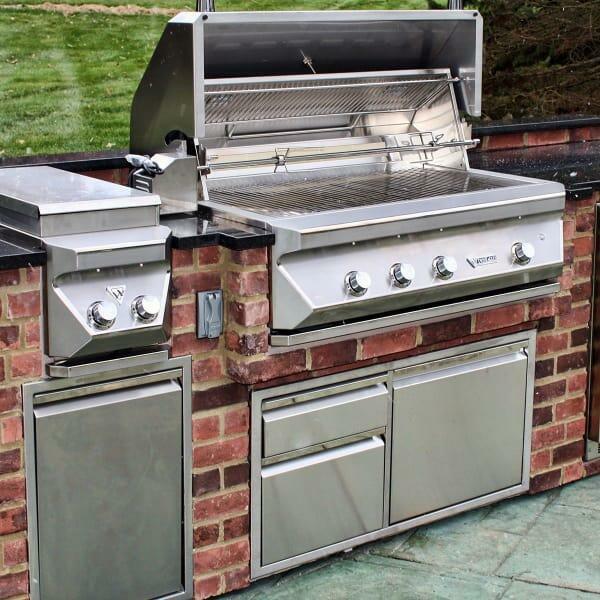 The White Outdoor Kitchen features a comprehensive outdoor cooking combination of Twin Eagles Grill, Twin Eagles Door, Twin Eagles Drawer, Twin Eagles Tall Trash Can, Twin Eagles Double Side Burner, and a Twin Eagles Outdoor Refrigerator. The components are aesthetically complementary to one another, and they sit atop a background of attractive antique brick cultured stone and a black spice granite tabletop. Family Leisure helped to recommend the best components to suit the White Family needs, and arranged them in the most efficient and attractive outdoor grill island configuration. The White Outdoor Kitchen delivers a full-bodied outdoor cooking space that matches perfectly with their Family Leisure custom fireplace. View the White Fireplace project on a separate page to get the full effect of a comprehensive cooking-and-entertaining outdoor space.